By Ruai (Rekha) Gregory, M.A. 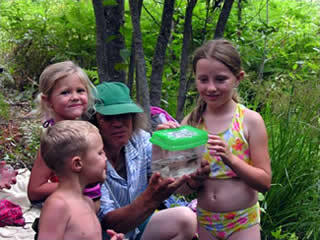 My husband, Forest (Viira Bhadra), and I began our summer Nature Camp program for 4-11 year olds at our home in northeast Oregon in 2000. 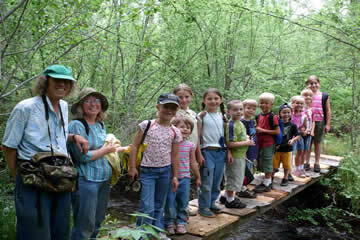 We had built and maintained a beautiful nature trail system on our 15 acres that we decided to share with children. Our backgrounds in education (including Neohumanist Education and Waldorf) combined with Forest’s experience in forestry provided the foundation for our program. However, as these things often do, circumstances, children’s responses and the land itself have assisted greatly in its evolution. We have found that children’s innate love of the natural world is heightened and encouraged in our environment, and the relationship they form with nature is potentially life long. For example, during the rest of the year, Nature Camp children will often stop me on the street to ask how “grandma tree” is doing, or how our waterfall survived the flood conditions. Speaking of “off season”, we have also sponsored a snowshoe field trip for the local school’s physical education classes, and have aligned with Winter Wildlands Alliance’s Snow School program (http://www.snowschool.org/snow/indexa.htm). The High School’s Environmental Science class has also visited several times. Look for things that change: cloud shapes, light patterns, bubbles, etc. Look for: shapes, colors, giant, tiny, light patterns, shadows, bubbles, waves, floating, flying, etc. Look for something that: is beautiful or wonderful, makes you feel happy or excited, you really like. Look from different viewpoints: standing, crawling, lying on your back or belly, upside down. Another observation we’ve made is that “simpler is better”. 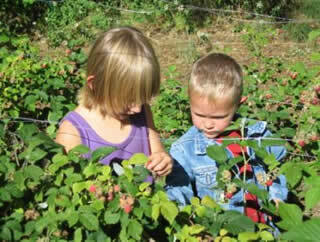 You’ll see in the sidebar how the concepts we include with children are all about nature appreciation. The science information is there, but is not the primary reason we’re out there. 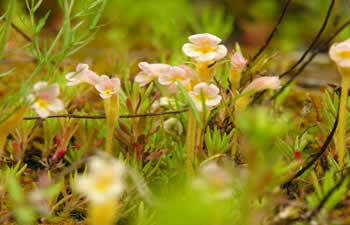 Our trails include creek, wetlands, grasslands, rocky hillsides and forests. 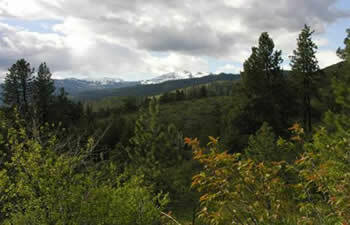 National Forest Service land borders us too, so we are able to lead extensive hikes too. We name all our trails and many of the features on them, e.g. the “Big Tree Trail” features Grandma and Grandpa Trees (the largest Ponderosa pines) and the Vanilla Treehouse has a very fragrant tree. We have a “Secret Waterfall” and a “Rocky Road” trail. There’s the “Pretzel” and “Squeeze Me” trees, and the “Hot Lava” trail has many volcanic rocks. There are “bug boards” along many of the trails to look under, and of course, the observant children notice many of the changes that happen each year, such as creek flooding, fallen trees and new bird’s nests. Our classes are typically one week long, meet in the mornings, with the 8-11 year olds having a camp out on the last day, which is often timed around the August Perseid meteor showers. We offered the program as part of an array of summer art courses in our area, sponsored by a local nonprofit arts organization. I coordinated the whole “Art Camp” program the first few years, keeping tuition costs low by supplementing with a variety of county, state and local foundation grants. These were easy funds to qualify for, since our area is quite remote, with very few children’s recreational activities available. Many artists live here, attracted by the beautiful surroundings, and were recruited to teach classes. Our enrollment and enthusiastic responses the first year really exceeded our expectations, and the program has established its success throughout the years. 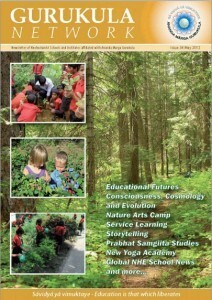 http://worldforumfoundation.org/wf/wp/about-us/history-and-past-events/2006-working-forum-on-nature-education/ describes the event and is part of the larger World Forum website. 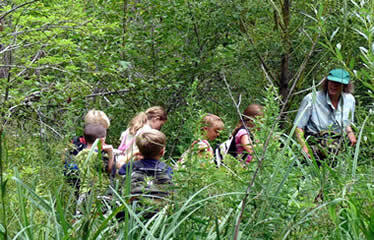 Arbor Day Farm also has developed their “Nature Explore” outdoor classroom program (visit http://www.arborday.org/explore/ ) to include many resources and a certification system that will assist children’s programs in creating their own nature-friendly learning environments. Give thanks to nature: the earth, trees, sun, water, birds, flowers, etc. 09:00 bathroom break, garden inspection, then — out on the trail! 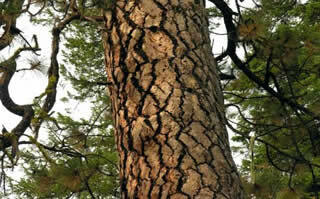 12:00 departurePlaces to explore and enjoy nature:Undisturbed natural settings: forests, mountains, lakes, creeks, etc. Outdoor observations: changing weather, clouds, wind, stars, birds, trees, bugs, etc. Healthy tip: be sure children get outside every day, regardless of the weather. Educate parents to send appropriate clothing for all seasons. Children become what they are surrounded by. Being surrounded by the beauty of nature invites feelings of amazement, wonder and love for the natural world. A child that loves and enjoys nature is a healthier and happier child. One result of our involvement in the World Forum was that we developed a workshop about our Nature Arts Camp program which we were invited to present at the Oregon Association of Child Care Directors Conference, which featured other speakers on the “Children and Nature” theme. We have since presented at numerous early education conferences, and our workshop became a “level 2” professional development course (part of Oregon’s career development system for early childhood teachers. See http://centerline.pdx.edu/ for more information). Various interns and student teachers have visited and studied with us, usually after attending a workshop or one of my college classes. I have found that I not only include aspects of neohumanistic education in all classes I teach, but also the latest information on including nature in any children’s school or program. I presented an inservice training to the staff at New Day School in Portland, and advised Didi Anandalalita at Ananda Dhiira master unit about strategies for developing and using the nature trails there for children’s activities. She then visited our Nature Camp during the older children’s program. Two of our Nature Camp “graduates” have become camp counselors! As soon as Devin, who came every summer, became 12, he asked if he could be an assistant. This summer will be his third, working with the youngest group. He is a fine team member. Elise has worked with all the groups for the last five years and will soon head for college. We also began taking 12-16 year olds on challenging hikes into the mountains, and last year we launched “Nature Camp for the Young at Heart”, which is a morning of hiking and other nature based activities for adults. The very newest development is the “Science and Nature With Young Children” college class! I just completed the first online 3 credit class group, and the response was simply fantastic. We used Last Child in the Woods and Discovering Nature With Young Children (by Worth and Chalufour) as texts, along with many online resources. The students developed curriculum, attended field trips and created beautiful environments. Most of them intend to keep in touch via a listserv regarding their ongoing projects! I plan to attend a “Leadership Seminar” at Arbor Day Farm this summer, which will provide training and networking for people developing similar classes at the college level, along with others who are actively advocating for nature education opportunities. This has been an incredibly inspiring experience.